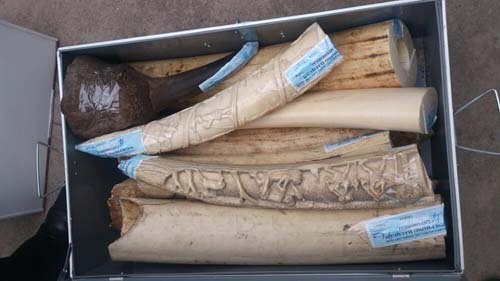 HA NOI (VNS) — Customs officers at Ha Noi's Noi Bai International Airport seized yesterday more than 65 kilos of ivory horns and tusks, believed to come from African rhinocerous and elephants. The material was contained in two packages sent from France. The seized goods included 18 elephant tusks weighing 60.56 kilogrammes and three horns, suspected of coming from rhinos, weighing 4.86 kilos. Examination showed that the tusks may belong to African elephants. The packages were received by Express Mail Service (EMS) office at Noi Bai Airport. A customs officer said this was the first time such prohibited goods had been sent from a European country instead of directly from Africa. He added that on the black market, a gram of rhino horn could be sold for US$133 while a kilo of elephant tusk, especially from an African elephant, could fetch $2,100. The total value of the ivory was estimated at dozens of billions of dong.